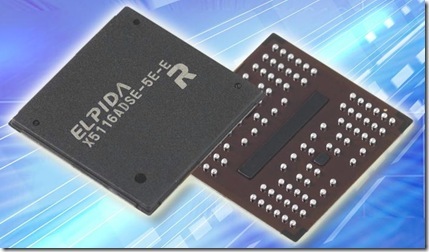 Elpida and Rambus have jointly introduced 512MB 4.8GHz XDR-structure DRAM that can deliver data transfer rate of 9.6 GB/s which is almost six times more than the current DDR2-800 RAM can achieve. These speeds are achieved as the RAM runs at Octal data rate of 600 MHz bringing the total clock speed to 4.8 GHz. This is the fastest DRAM that is available in the market now. These new high speed RAM would be available in April 2008. Elpida’s 512Mb, 4.8GHz XDR DRAM (Part number: EDX5116ADSE-5E-E) device is organized in 8-banks (x16/x8/x4 programmable), and with a 9.6GB/s data transfer rate delivers six times the peak bandwidth of industry-standard DDR2-800 memory devices. The 4.8GHz XDR device is manufactured using Elpida’s 70 nm process technology and is available in a 104-ball FBGA package. To support both high-speed and robust data transfer, XDR DRAM utilizes key enabling technologies built on patented Rambus innovations such as Differential Rambus Signaling Level (DRSL), which minimizes signal swing and noise; Octal Data Rate (ODR) technology which transfers eight bits of data on each clock cycle to achieve 4.8GHz operation with just a 600MHz clock; and FlexPhase™ circuit technology for precise on-chip data alignment with the clock. The 512Mb XDR DRAM device also features adaptive impedance matching, dynamic request scheduling and zero overhead refresh. The clock speed and data transfer rate are pretty impressive. But what bothers me is who would be adopting this RAM technology? whether Intel or AMD? I feel there would be a new chipset from either of these CPU manufactures that would add support for these XDR structure DRAM. Another question that arise is what would be the price of this RAM? My gut feeling tells that it is going to be expensive and probably enter the server market first rather than the desktop market.